Published on September 28, 2016 in General. 0 Comments Tags: Amiga CD, DrewFX, star fighter, video. Did you know that people have been making games in Western Australia since the early days of the industry? Star Fighter: D’Yammen’s Reign by GeoSync Media is one such locally-made game, first released around 1998 on the Amiga CD. Since not everyone has the opportunity to break out an almost 20 year old game, you will be happy to hear that the Star Fighting of yesteryear can still be experienced thanks to online gameplay videos. Check it out below, and if you want to find out more about the many games that have been released in Western Australia over the years be sure to visit out the WA Released Games List. Published on April 26, 2011 in Releases. 2 Comments Tags: Andrew Hawkins, DrewFX, game, iOS, Turbo Flick: Demon GPU. Wow. We knew that DrewFX were planning a new iOS game release, but we weren’t expecting this! Turbo Flick: Demon GPU is quite a departure from DrewFX’s last game, Surf Prodigy, and the fact that it’s so different really demonstrates the developer’s versatility and creativity. Somewhere in one of these computer memories the Demon GPU was born. Now it is in your mobile device. It will destroy your world – unless, you can defeat it first. Battle your way through 6 sectors to find it. There the Demon GPU will be waiting. You can buy Turbo Flick: Demon GPU on the App Store now! Published on December 9, 2010 in Video. 0 Comments Tags: 2010, Binary Space, Different Methods, DrewFX, goodtimes, Handwritten Games, RocketHands, timelapse, video. Thankfully our resident videographers, Richard and Ben, have put together a fantastic short that captures the good times that were had. 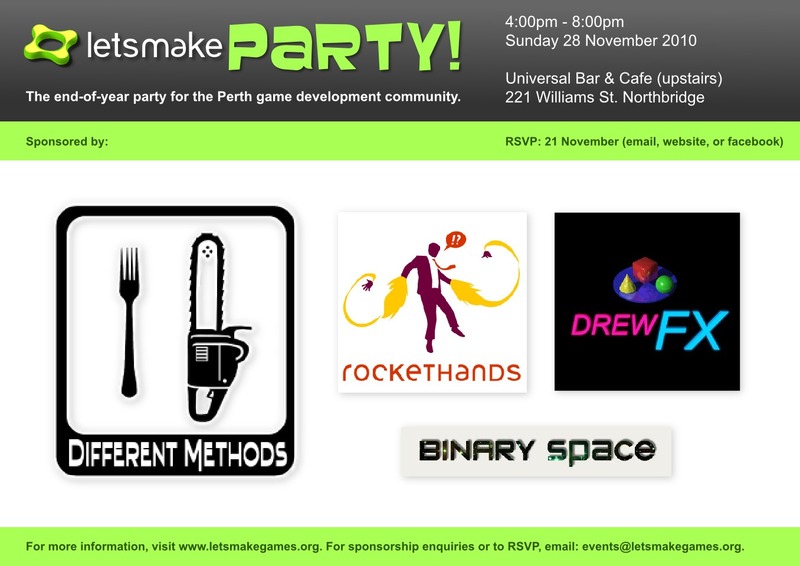 Enjoy the contagious enthusiasm of the Perth game development community! Still craving more nostalgia? Check-out photos from the event, and the playlist of locally developed content that was screened on the night. Published on November 3, 2010 in General. 0 Comments Tags: Binary Space, Different Methods, DrewFX, Let's Make Party, RocketHands, sponsors. Let’s Make Games is entirely volunteer-run and large events are really dependent on sponsorship and turn-out. Different Methods is once again our major sponsor for the second year running. A quiet achiever but clearly Perth’s premier commercial game developer. Unassuming and unpretentious, their website simply states: “We make games”. And that’s exactly what they do – with a positive and inspiring just-get-on-with-it attitude. Rockethands is also sponsoring us for the second year running. Regular game-jammers and event attendees, the Rockethands team have: a whole bunch of collective commercial experience; produced numerous indie games; released two iPhone games and one iPad game; and even produced a popular music video under their own label (Rocketband)! DrewFX joins us this year as our most eager sponsor (they contacted us within minutes of the event announcement, keen to get funds to us ASAP!). They are probably most well-known for their iPhone game Surf Prodigy or via their presence in the Torque community. Binary Space supported last year’s end-of-year party as volunteers, and this year they have come on board as sponsors. They are probably the only local game developer whose work has been featured on the National Geographic website (seriously, check out the link). To our sponsors: We salute you! Thank you for your support! It’s still over three weeks until the party, so there is plenty of time for new sponsors to sign-up, and we are still looking for volunteers to help on the day. Please contact us if you would like more information on sponsorship or volunteering. Update: Handwritten Games has also signed on a sponsor! Published on July 21, 2010 in General. 0 Comments Tags: Cellblock Squadrons, directory, DrewFX, game, game profiles, RocketHands, Space Crash, Super Furious Software, Surf Prodigy. As a reminder, you can submit developer and game profiles by completing the corresponding surveys that have been running since April. What’s That in Your Pocket this Tuesday night! Published on July 27, 2009 in General. 1 Comment Tags: Black Lab Games, Crewjo, demonstration, Dissidia, DrewFX, event, game, gametraders, GO3, Interzone Entertainment, iPhone, Istpika, Kruger Heavy Industries, portable, PSP, RocketFuse, RocketHands, Sandbox Software, showcase, Spinfast, Staring Man, Subversive Games, Surf Prodigy, The Velvet Lounge, videos, What's That in Your Pocket. Our pocket-gaming social event is on tomorrow night (Tuesday July 28) so be sure to make your way down to The Velvet Lounge at 7:30pm. Let’s Make Games events are fun social get-togethers for local game developers and gamers. It’s great to catch up with the local scene and see what people they have been working on, and there’s always a friendly atmosphere for curious newcomers. GameTraders (Carillon City and Carousel) will be bringing along two PSPs for a pre-release demonstration of Dissidia: Final Fantasy. One PSP will be connected to a projector for general viewing. Dissidia: Final Fantasy is scheduled for local release in September. 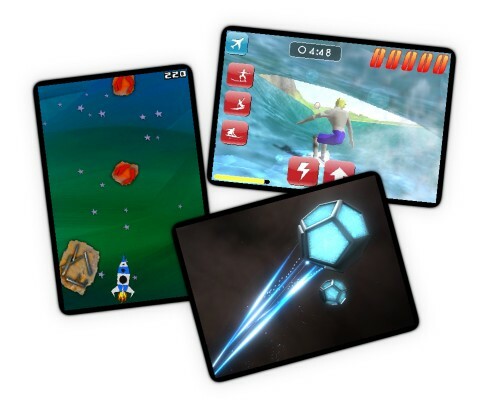 A number of local games companies will be demonstrating their latest iPhone games. This includes Surf Prodigy by DrewFX and RocketFuse by RocketHands. Also attending (and possibly demonstrating) will be game developers from Istpika, Spinfast, Staring Man, Subversive Games, Black Lab Games, Interzone Entertainment, Sandbox Software, and Kruger Heavy Industries. Crewjo are looking for local mobile game developers and may make a brief announcement. Finally, GO3 will be announcing a special opportunity for local developers to showcase their work and to network with other companies at the upcoming GO3 Electronic & Entertainment Expo in October. We apologise if we missed mentioning any developers who plan to demonstrate and have RSVP’d. Feel free to bring along short promo videos (on a USB stick) for our video loop. The Let's Make Games archives for the drewfx tag.